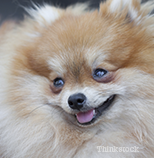 Jezzy is not your average Pomeranian, she’s a Pomeranian with a flair for fire safety! As reported by Jessica Leicht of WTVY.com, volunteer firefighters found out about Jezzy’s special skill when they responded to a fire recently in Rehobeth, Alabama. Resident Madie Russ told WTVY, “We was all in the bed sleeping and the dog Jezzy kept barking, barking, barking trying to wake me up. I wouldn’t get up and when I did get up – I opened my bedroom door and the flames was coming through, the ceiling was falling down, the house was on fire.” Thanks to Jezzy, who’s been a member of the family for over six years, Russ and her two grandchildren were able to escape the blaze. Leicht reports that although Jezzy and her family were able to get to safety, you should never rely on a pet to warn you of a fire. Susan Holmes, of the American Red Cross, stresses that the number one priority for your home should always be a working smoke detector. What's your favorite heroic pet story? Tell us below!